Getting a nutritious, warm meal on the table each night for dinner can be stressful. Even though I plan our meals each week, I still look for ways to make the process easier and run more smoothly. For advice on how to reduce the stress, I decided to interview large families to see how they manage the chaos and keep their families full. The families: I interviewed 10 families with three or more children. Four of the families have three children, three of the families have four children, two have six children, and one has eight children. Ages range from two weeks old to seniors in high school, but all the families have at least one or more children in elementary school. In half the families, both parents work or are in school full time. In the other half, the father has a full-time job outside the home and the mother manages the business of the house. These families live all across the U.S. and they are all two-parent families. The interviews were surprising in many ways, but what caught me off guard was how often I heard similar responses. I was not expecting there to be as many trends in the answers as there were. There seems to be an art to feeding large families, and all of the families I interviewed are accomplished artists. The biggest trend I found is that mealtime is a focus of the day for these families and dinner is not something these families just want to get through. Dinner is a valued destination and is the one time each day when these families come together as a unit. Eat together. In 8 of the 10 responses, the entire family eats together at the dining table at least six nights a week. In one family, dinner is at 4:00 p.m. so the family can eat together before the kids go off to practices and lessons. The father of this family goes to work at 6:00 in the morning so he can be home by 4:00 for the family meal. Another family gives kids high-protein snacks after school to keep them from attacking each other before dinnertime at 7:00 p.m., when everyone is finally home from work and after-school activities. Irrespective of when they eat, these families place a high priority on dinners together. Most sit down to dinner around 5:00 p.m. Six of the families reported sharing breakfast together, too. Eat at home. The children eat at home, and they eat food made at home. One family said they do pizza delivery six times a year for their kids, but that was the only mention of restaurants in the entire survey. Weekly meal planning. All families reported doing some type of meal planning. Whether it means they plan meals based on what the local butcher and stores have on sale (almost all subscribe to the weekend paper to get coupons and sale announcements), build meals on what the CSA delivers or what is in ample supply at the farmers market, scribble meal ideas on the back of grocery lists, or use a formal meal-planning chart — they rarely fly blind. None of the families do monthly meal planning. Prepare ahead. The majority of respondents said that some meal preparation is completed earlier in the day. Vegetables might be chopped or casseroles are assembled or items are put in the slow cooker or meat is defrosted hours before dinnertime (usually while preparing breakfast). In three families, fathers make their lunches and their children’s lunches for the next day while the rest of the family cleans up after dinner. Shopping at more than one location. Not only did families report wanting to get the best deals, but they also want to get the best food for their dollars. Almost all families reported to buying only hormone-and-antibiotic-free meat (when they eat meat), relying on farmers markets for produce during the summer, and eating as little commercially packaged food as possible. This meant that grocery shopping didn’t happen in one weekly trip to one store, but to many locations to get exactly what they want. All families reported that the majority of shopping is done on the same day each week, but that one or two “quick trips” are made to pick up additional items later in the week. Very little meat. More than half of the families said they only eat meat a couple times a week. Although cost might be part of the reasoning for this decision, health concerns and freezer space were the reported motivations. None of the families interviewed is strictly vegetarian. Everyone eats the same meal. None of the families make entirely separate meals for picky eaters. A few families said they make extra portions of favorite foods for picky eaters that they freeze so if one food at a meal is refused, there is an alternative on hand. However, the child is responsible for heating up this side dish on her own and can only do so if the leftover is available. In families with children with food allergies or intolerances, the whole family follows the special diet. One responder said she tries to incorporate two new main dishes into the meal plan each week. She does this to introduce her children to new foods and new flavors, but pairs the entrees with favorite side dishes in case the meal isn’t a hit. Teaching opportunity. Seven of the families responded that mealtime is also a great time to teach life skills, like organizing. Their children are involved in cooking, planning, cleaning, and even creating a food budget and shopping. One mother occasionally changes the serving sizes on recipes to have her kids work the math problems. Divide responsibilities. Again, 8 of the 10 families reported that all family members help in the mealtime process. A young child sets the table, an older one slices vegetables, a third child grates cheese, one sweeps the floor after dinner, one rinses the dishes, dad loads the dishwasher, etc. In only one family do children sit and do their homework while mom and dad prepare the meal. In this family, the children are responsible for cleaning up, however. The head chef. Mom is usually in the role of head chef, but sometimes it is dad and sometimes it is an older child. Irrespective of who it is, the head chef is responsible for coordinating what responsibilities each person in the family has for that night’s dinner. This coordinator doesn’t do all the work, but rather makes sure all the work surrounding mealtime is completed. One family explained the head chef’s role as being similar to a conductor’s role in an orchestra. Who will be head chef for a night is determined during the meal planning stage. One family doesn’t use formal serving dishes, just puts the pots and pans right on the table, to save on dishwashing later. Once a week, one family eats off china dishes and pretends to be dining in a fine restaurant, complete with dress code. This isn’t really organizing related, but I found it interesting nonetheless. In a family with six children, favorite meals are rotated into the plan at one a week, so it takes eight weeks but each family member gets their favorite meal six times a year. Favorite meals are tracked on the central family calendar. One family makes double portions and freezes half for a meal they’ll eat in a week or two. Surprisingly, the only two families that relied on make-ahead services like Dream Dinners were the two families that eat in shifts and not together. Both of these families also only have three children. My guess is that price is a factor in using these services, and that they are too expensive for very large families to use on a regular basis. One mother writes what the family had for dinner on a family calendar and then reviews the calendar when meal planning to make sure one food doesn’t get into heavy rotation. One family has a no complaining rule and anyone who complains about the meal has to wash all the dishes by hand even though they have a dishwasher. Again, this isn’t really organizing related, but I thought it was a fun rule. Only one responder mentioned making dessert each night. Dessert doesn’t seem to be a regular part of large family meals, at least for the families I interviewed. I didn’t ask this question, but six families reported mom and dad go out on a date night on the same night each week. On these nights, the children still typically eat a meal prepared at home, but they eat together with a sitter or grandparent. The responder with eight children (her oldest is only 12) summed up her mealtime perspective with a nice catch phrase: “Keep the majors major and the minors minor.” For her, the major is sitting down to a meal with her family each night. The minors are missed ingredients and foods that didn’t turn out exactly right. I believe this perspective and the insights listed above can help all of us, regardless of family size, to reduce the stress surrounding mealtime. It is rare for all our socks to have mates after we finish folding the laundry. Sometimes a sock will hide inside a fitted sheet and we won’t notice it during folding, but we discover the errant sock when we put the sheet on the bed a few days later. Other times, a sock will have been stuck inside a shirt sleeve or a pant leg. Rarely is the missing sock lost forever, though, so we keep a small basket in the laundry room for single socks and when the mate shows up we immediately know where to find its match. Even though mates are usually found, invariably one sock will hang out in the lost-mate basket for many months, its mate gone forever. (After seeing Gnomeo and Juliet, I’ve been blaming lawn gnomes for this phenomenon.) If a sock hangs out in the lost-sock basket for more than three months, the sock is moved to the rag pile and recycled for dusting. The woman then let out an audible gasp, almost as if my suggestion had caused her physical pain. My guess is that, like many people, she struggles with making decisions about “what if” items, and these “what if” objects likely cause her difficulty when dealing with clutter. What if I get rid of this empty yogurt tub and then someone comes over for dinner and I want to send her home with leftovers? What if I get rid of this piece of wood and then two months from now I need to fix something and this exact piece of wood would have been the perfect solution? What if I give this coat to charity and then wish I hadn’t? If you’re someone who regularly plays the “what if” scenario in your mind, try giving this simple lost-sock basket a try in your home. Recycle any sock that remains in the basket for more than three months. Since you know the worst that can happen is you might end up recycling two socks, it’s a relative inexpensive way to practice making these types of uncluttering decisions. You don’t need a single sock hanging around your house for years waiting for a mate. The more practice you get, the easier it will become to part with things that you do not need that are cluttering up your space. You learn to trust that even if you end up needing an item that you purged that you will be able to buy a replacement or borrow one from a family member or that you will be creative enough to find an alternate solution. And, if you do find the lost sock in less than three months, you’ll at least know quickly where to find its mate. Cable management is what makes this desk beautiful. If there were cords hanging beneath it, you would never notice the stunning wood desk. Its smooth, clean lines and unadorned hardware could easily be missed if clutter were in the way. H Sterling has attached a small power strip to the back panel of the desk so only its cable runs down the leg and off to the outlet. Additionally, the model of the SR-71 Blackbird is the only decoration on the desk, which makes the red Swingline stapler appear to be more than a utilitarian tool. 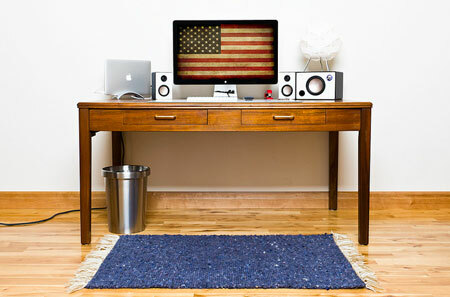 The desktop wallpaper, set against this streamlined space, even looks like curated artwork. Thank you, H Sterling Cross, for your submission to our Flickr pool. 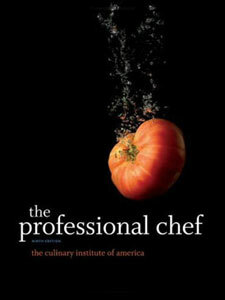 I’m currently reading the ninth edition of the Culinary Institute of America’s textbook The Professional Chef. I don’t have any desire to be a professional chef, I simply decided to read it to help me step up my game in my home kitchen. I’m only a few chapters into this book, and I’ve already learned a wealth of information. 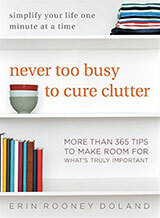 Much to my surprise, the book is full of fantastic organizing advice. In hindsight, I should have expected this since having an organized restaurant can be a key component in a restaurant’s survival. A poorly run kitchen can produce health code violations, waste money on unused or overpriced food, make for a bad dining experience, and create high employee turnover. The better organized a kitchen and its staff, the more a restaurant can focus on the food and quality of service it provides. The Culinary Institute of America (CIA) teaches the “Kitchen Brigade System,” which was initially “instituted by [Auguste] Escoffier to streamline and simplify work in hotel kitchens.” His system gives specific responsibilities and work stations to each person in the kitchen, so there is less duplication, cross contamination, and confusion about duties. The system is led by the chef (known as the chef de cuisine in French or the executive chef in English) and can include up to 18 positions that report to the chef (such as the sous chef, saucier, grillardin, all the way down to the commis, who is an apprentice learning how to work a station). One of the most interesting stations in this system, at least to me, is the cold-foods chef, referred to in French as the garde manger (which translates from French into English as pantry). The cold-foods or pantry chef is “responsible for preparation of cold foods including salads, cold appetizers, pates, and the like.” In many kitchens, the garde manger is also responsible for all the foods stored in the pantry and walk-in refrigerators. In our family, managing the food in the pantry and refrigerator is my job, and it’s a lot of work for just the three of us. I can see how this is a full-time job for someone in a restaurant or hotel, which is feeding hundreds of customers daily. Instead of being just the guy who makes salads, the garde manger is an inventory and organizing guru. Cut down on food waste by clearly marking when you purchased an item and when you opened it. Knowing these dates can help you to use food before spoilage and to be sure you only throw away food that can make you sick. Blue painter’s tape and a Sharpie are perfect for these tasks. You can stick a piece of blue painter’s tape to reusable containers and then write the information on the tape, or if the packaging isn’t reusable (like a can or box) simply write directly onto the top of the product. Label the dates as “Bought” and “Opened” so it’s clear what the dates indicate. Refrigerate and freeze foods at their proper temperatures. Use a thermometer to ensure all parts of your refrigerator and freezer are maintaining consistent and proper temperatures. Your refrigerator should be around 36ºF, unless you regularly store fish and seafood, and then it should be a couple degrees cooler (in the 32ºF to 34ºF range). Produce can be a little warmer — lettuce, carrots — at 40ºF, but those temperatures are too warm for all the other foods (meat, poultry, dairy, eggs, etc. ), so it’s best to aim for 36ºF. Typically the front of the refrigerator is warmer than the back, so store produce at the front of your shelves and meat, poultry, and fish at the back of your shelves. Never store cleaning supplies in your pantry so no one ever makes a mistake and puts cleaning chemicals into food. You also don’t have to worry about cleaning supplies spilling and ruining your stored foods. When putting items away, arrange the items so the oldest items are at the front of your pantry shelves and the newer items are at the back. This will help you to use the food item before it goes bad. The book calls this the “First In, First Out” rule. Group dry foods in your pantry by type. You will likely have categories for: flours, rice, corn products (cornmeal, corn starch), leaveners (baking soda, cream of tartar, baking powder), thickeners (arrowroot, gelatin), oats, other grains (barley, quinoa), pasta and noodles, legumes (lentils, beans), nuts and seeds, spices, sweeteners (honey, brown sugar, sugar cubes, powdered sugar), oils, vinegars and other non-perishable condiments, cooking wines, extracts, coffee and teas, and fruits and vegetables that do not require refrigeration (potatoes, apples). 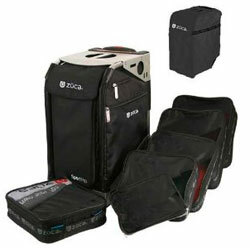 You may also have a section for packaged snacks and canned items. Clearly label shelves so that it is obvious where items belong. This helps improve your ability to maintain order in your pantry, and also helps other people to find items and properly return them. You can use a label maker or adhesive shelf label holders for this task. If possible, adjust shelf heights to best accommodate your goods. Strangely, this is an easy step to skip but will likely increase your pantry’s storage capabilities. Store the items most often accessed in your pantry on shelves at heights between your hips and shoulders. Heavier items you access less frequently should be at heights between your knees and hips. Lighter items you access less often can be stored on shelves at heights above your shoulders. You may want to keep a step stool in your pantry or nearby, so getting to your food is a simple endeavor. Do not store anything on a pantry shelf at floor level. This is a good place to keep reusable boxes, paper grocery sacks, and other non-food pantry items that won’t have future contact with food. Keep shelves clean and immediately deal with any spills to ward off pests and spoilage. I recently heard a tip to line refrigerator and pantry shelves with Press’n Seal Food Wrap. When it’s time to clean the shelves, pull up the dirty wrap and press down clean wrap. It’s much easier than spending the day scrubbing milk rings off refrigerator shelves and much less expensive than doing the same thing with Contact Paper. At least once a week, do an informal review of your refrigerator, freezer, and pantry. Get rid of spoiled and expired foods, make notes about items that are running low, and clean up any spills you may have missed when accessing items. If you’re looking for visual inspiration, check out Better Homes and Gardens’ slideshow on how to store more in your kitchen. My favorite images are: Use Clear Containers for Dry Goods (I love how the cooking instructions and nutrition facts are taped to each container), Store Stuff on the Doors (the additional storage is perfect for teas, sweeteners, and other items accessed frequently), Pantry Drawers (perfect for homes without traditional pantries), and Cubby Organization (marvelous for small appliances). Stay tuned for an article next week with dozens of interviews from large families talking about how they organize dinner preparations, cooking, feeding, and cleanup on a nightly basis. The strategies they employ to feed their families of five, six, seven, eight or more can help everyone — and that includes singles and small families like mine — to get a nutritious meal on the table every night without stress or breaking the bank. My word. 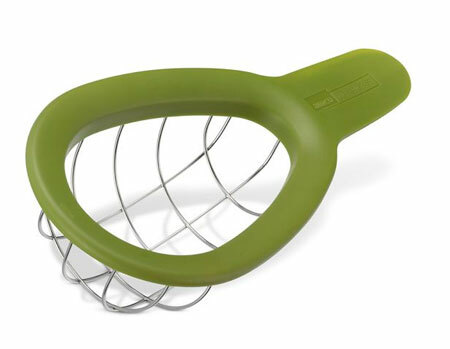 Are people really so rushed for time that they can’t watch a one-and-a-half minute YouTube video to learn how to cut an avocado with a knife, but somehow have enough time to drive to Williams-Sonoma to buy this thing? What confuses me the most is that you have to use a knife to cut the avocado in half and remove the pit just so you can use this device. Therefore, you dirty a knife and the Avocado Cuber, creating twice as many dirty dishes. Any time you might save using this device (which, my guess, is not that much) you then waste when you have to wash twice as many gadgets after slicing. 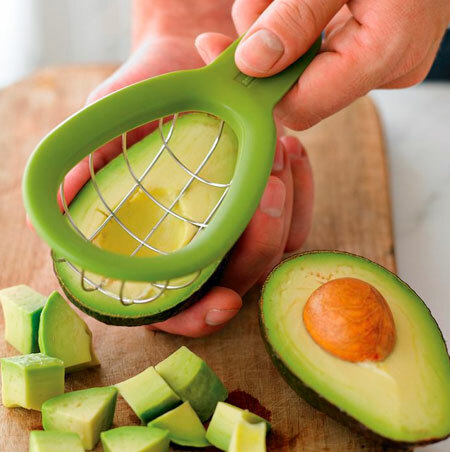 Well, if you like extremely specific kitchen tools made for just one purpose, don’t forget to buy an Avocado Pit Removal Tool, an Avo Saver (you’re apparently saving the “avo” half, not the “cado”), and an Avocado Knife to go with your Avocado Cuber. Who only knows how you will function in your kitchen if you don’t have all four specialty gadgets?! Take photographs of all areas of a room and then look intently at the pictures. I’m not sure how it works, but analyzing an image can often help you see clutter you’ve become blind to in person. Dust bunnies under your monitor, stray toys under your dining room buffet, junk mail on your fireplace mantel jump out in photos but blend into the woodwork in person. Invite people over to your house for a party. Again, I’m not sure how it works, but having non-immediate family in your home can often make you to see clutter you had been previously immune to in your space. Become a stray stuff collector. Grab an empty laundry basket and see how many stray objects you can find in a room. Record the number, and then repeat the process in exactly one week. Do this task weekly in a room until the number regularly falls below two stray objects. Then, repeat the process in another room. Notice repeat offenders. If you are constantly finding the same object out of place, you may have the “wrong” storage space for the object. Would you be able to store the object in a more convenient location so that it’s not constantly cluttering up a room? A place for everything. Be sure everything you own has a permanent storage space. If it doesn’t, the object will always be out of place. This means you should have a permanent home for stamps, rubber bands, paper clips, spare change, bills, gift cards, medicine, etc. How do you deal with perpetually out-of-place stuff in your spaces? Share your strategies — and your struggles — in the comments. At least for those of us in the northern hemisphere, January is a great time to make summer travel plans. You are able to beat the rush and still get some good deals on popular travel destinations, as well as you are able to think about things other than the cold and wind and snow currently going on outside. It’s also a good time to curl up under a warm blanket with a cup of hot chocolate and thumb through travel magazines or travel guides to learn as much as you can about the place (or places) you want to go. When planning a trip, it’s best to start by analyzing your budget. How much do you already have saved? How much can you save before deposits and tickets need to be made or purchased? How much can you save before the actual date of travel? Once you know how much you will be able to save for your vacation, you can narrow down the locations of where you wish to go, how you wish to get there, where you will stay while there, and what you wish to do when you’re there. Or, as you probably refer to it as, an Expense Budget. As you’re writing down your expenses, don’t forget that you may need to purchase a few special items before your trip — a new swimsuit or larger memory card for your digital camera or a travel jacket — and you’ll also need to eat while you’re on the road. If you’re someone who buys a trinket or two while traveling, budget for these expenses, too. WiseBread.com has a terrific round-up of travel websites that can help you to save money, “40 Most Useful Travel Websites That Can Save You a Fortune.” The article is a few years old, but most of the websites are still in business. When making your plans, you want to be sure to get the best deal possible so you aren’t wasting any of that money you so diligently saved. With the money part of the equation settled, turn to the internet and/or your travel guides for itinerary inspiration. Save articles to Instapaper or Evernote. Pictures of destinations can be pinned to Pinterest. Maps, hotel reservation numbers, flight plans, car rental receipts can also be saved to Evernote. Services like TripIt work, too. If you are traveling outside the U.S., you may want to keep a file folder of this information to carry with you, especially if you don’t plan to have an international data plan for your smart phone when you’re overseas. 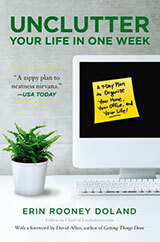 As the months pass and you get closer to your time of travel, check out travel expert Chris Guillebeau’s article “Stress, stuff, and world travel.” It’s crammed with extremely useful information for jet-setting in an uncluttered fashion. This just may be the cutest, most precious unitasker ever! Introducing the Tea-Boy Penguin Tea Timer. Beginning later this spring the Nintendo Wii will support on-demand streaming of content from Netflix. Last Wednesday, Boston Herald columnist Darren Garnick publicly admitted that his previous love of disorder may have been misplaced. In his article “Pride in messy desk replaced with ‘sinking, drowning feeling’” on January 13, Garnick professes his new appreciation for being organized. If board game and puzzle organization has you stumped, here are some suggestions for getting your games in order. I have something that I love that recently broke by accident. It has sentimental value (passed to me from an aunt), it is aesthetically my style, it was useful, and it made me smile whenever I saw it. It is still all those things, except that it can no longer be safely used (nor repurposed). It’s also not reparable, and I don’t know where I could get another one to replace it. How do I get rid of it? Any other object like this would go in the trash, but I love it so much. There’s really nothing that can be done with it even if I did save it—it would be clutter. How do I walk myself through this process of getting rid of it? Seems silly to be grieving such a simple object, but I am. When accidents happen to objects we used faithfully and loved, it can be difficult to let them go. It’s certainly not easy for me. The objects feel like trusted friends who were there for you when you needed them. I think the first thing you need to do is thank the object for its service. You could literally say something aloud to it, or you could just spend a minute or two thinking about all the good times you shared. It seems a little silly, but it helps to have the formal goodbye. Once you’ve acknowledged its service, you can decide how to proceed. Obviously, you can just dispose of the object and be done with it. However, you might need a little more than this to help ease the pain. You can make a visual tribute to it. Get a shadow box and decorate it with pictures of you and your aunt using the item and maybe a piece of the actual item that broke. Hang the tribute on the wall as long as you need to until your time of grieving has past. If you’re a journal keeper, you could also glue a picture of it in your journal and then write down the things you thought about it in your formal goodbye. Since you don’t say exactly what the item is, it’s hard for me to know if you sincerely can’t repurpose it. My guess is that you could break off a chunk of it, drill a hole into it, and make a small piece of it into a bauble on your key ring. If it’s soft, you might be able to sew a piece of it onto a quilt or something else that you use in your home. I’m sorry you have lost a favorite item. Be sure to check out the comments where our readers may have even more ideas for you. Thank you, Lirpa, for submitting your question for our Ask Unclutterer column. 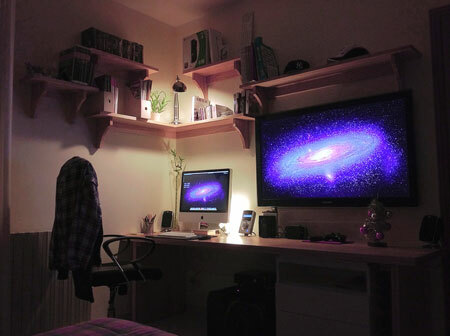 According to the description on Flickr, Skorpion24 made the shelves and desk for this room. What is nice about making custom pieces is that you obviously get exactly what you want for your space. In a workspace, having the ideal setup you want can help you to be more productive because you want to be in the space and all of your supplies have a home. The office also incorporates an Ikea filing cabinet that fits perfectly under the desk and my guess is this piece of storage was figured into the construction design. The cable control is also very well done in this office. Thank you, Skorpion24, for sharing your office with us.